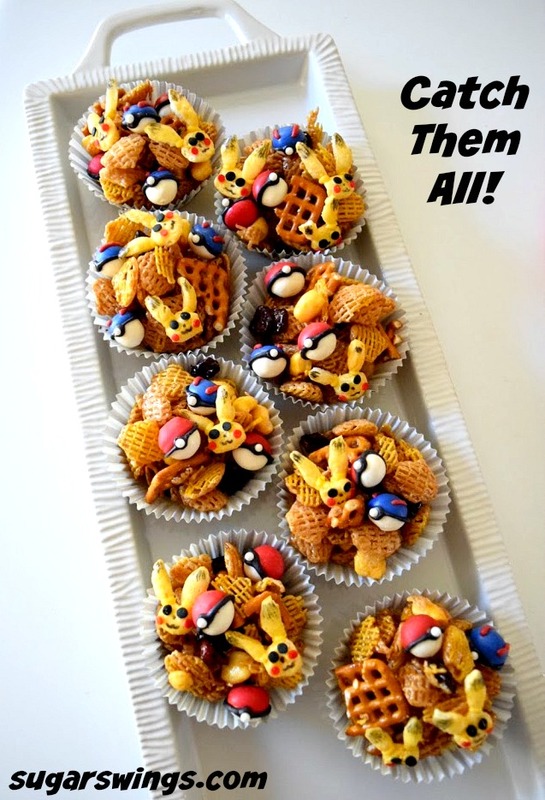 Are you into the Pokemon craze like we are? The kids and I have such a fun time playing it. What's not to love - super cute Pokemon characters, augmented reality, gamification and exercise! We walk around catching Pokemon, hitting Pokestops, and battling in gyms - and bonus - we talk to each other about neat topics while doing all this. It's actually a great way to do something fun with the kids (and something they like just as much). If you have kiddos all into Pokemon Go, then this cereal snack mix will be a hit. It's sweet and salty and seriously addicting. 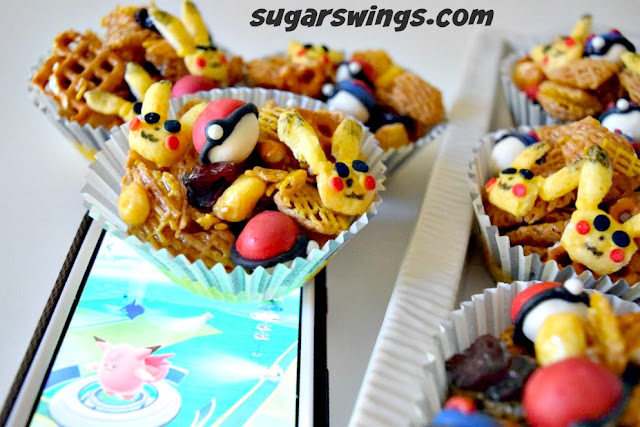 The Pokeballs are made from yogurt covered pretzel balls. 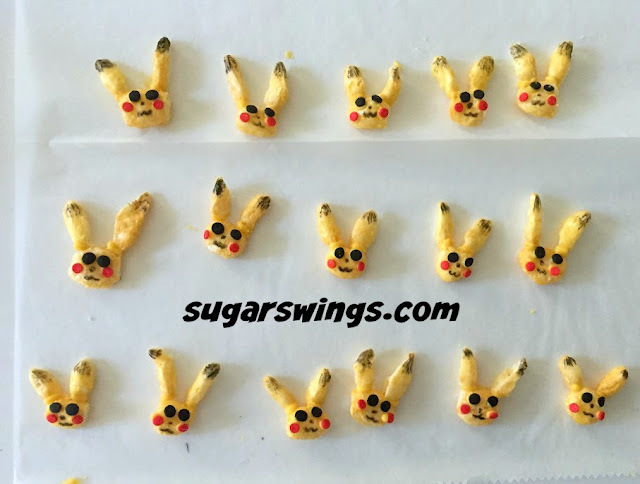 The tiny Pikachu heads are made with Corn Pops cereal, red and black sprinkles. Yellow melted candy wafer was used to attach everything together and black edible marker for ear, nose, and mouth. And because regular Pokeballs were not enough - I also made Great Pokeballs. You know just in case you have a really tough Pokemon to catch! OR serve in individual cups! 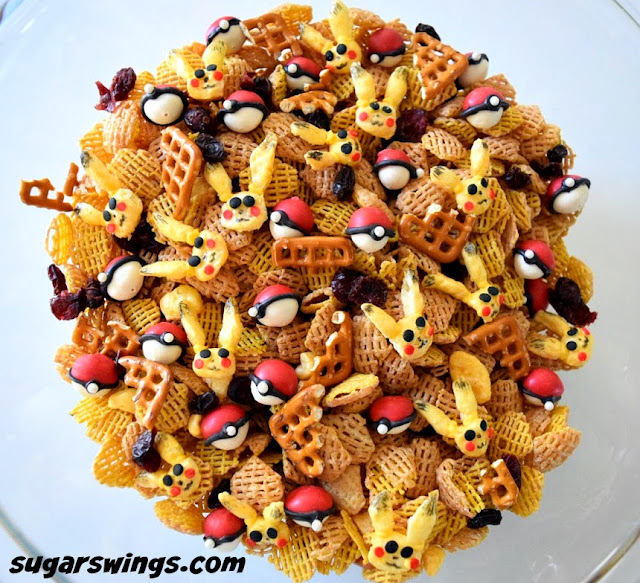 This sweet and salty cereal mix would make a great addition to any Pokemon party or if you need to restore your energy after a long afternoon of pokemoning! PS In case you are wondering I'm currently Level 15 - 105410 XP and Team Mystic! Combine 1st 4 ingredients in large bowl. Combine butter, syrup, brown sugar, salt in bowl and microwave 1 minute until melted. Add baking soda and vanilla and microwave another 30 seconds. Add to bowl with cereal and mix well. Spread onto backing sheet to dry. 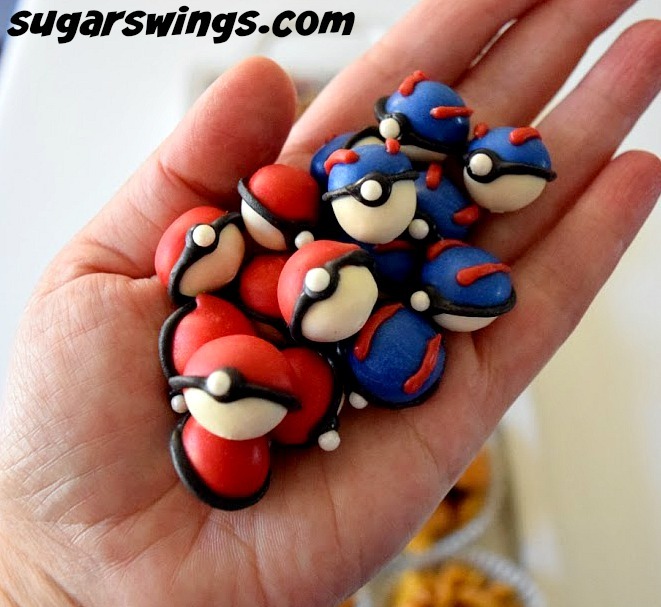 For Pokeballs: Melt some red or blue candy melts in small bowl in microwave in 20 second intervals until candy is just melted. 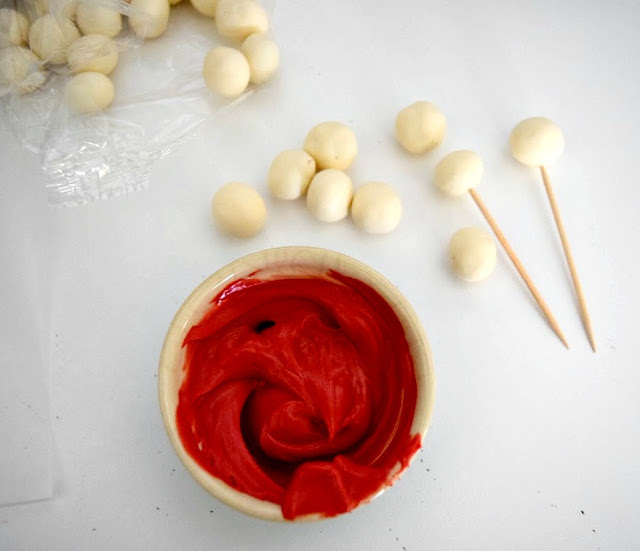 Insert toothpick into bottom of pretzel ball and dip 1/2 into candy. Let harden 10 minutes. Melt black candy melt in microwave and add to a freezer bag. Snip one small corner and pipe the black detail onto ball (use picture of pokeball as guide). While black candy is still wet attach white ball sprinkle to center. Do the same for blue great balls except use blue melted candy wafers and add 2 red lines on top of ball with melted red candy wafers. For Pikachu: Find the right sized Corn pop cereral for the head. Cut 2 small ears out of the cereal for each head. Melt yellow candy melt in microwave and add to a freezer bag. Snip one small corner and use it to attach the ears to the head. Let harden. 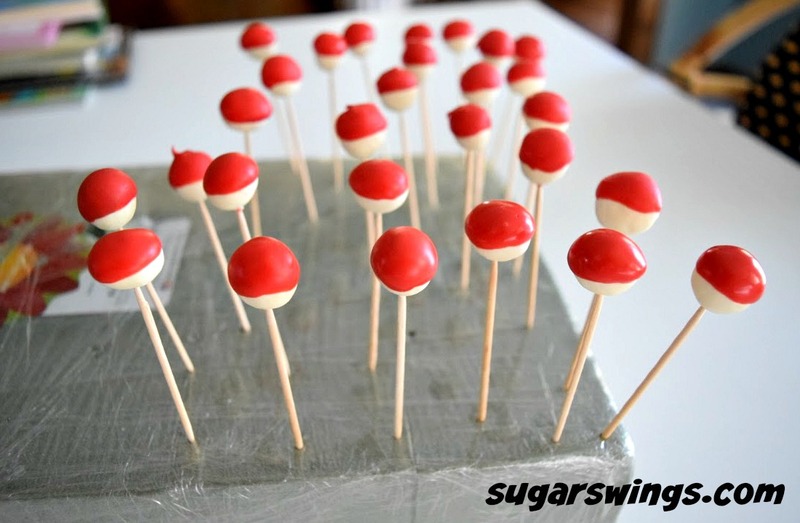 Use more melted yellow candy to attach red and black sprinkles. Add mouth, nose, and ear detail with black edible writing marker. 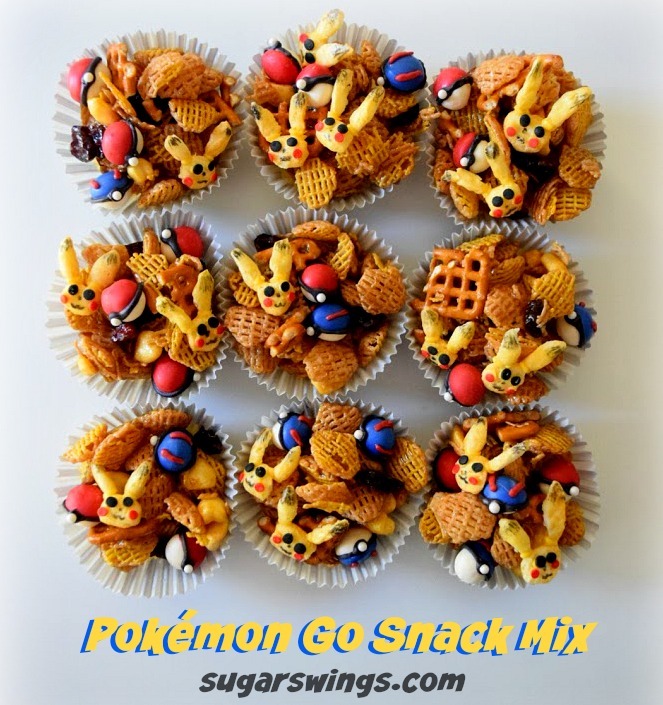 Add pokeballs and pikachus to snack mix before serving. Store in airtight container.